This week I went to see the limited showing of Peter Jackson’s “They Shall Not Grow Old”. By now, you probably know that the film has been colorized, and dubbed, all with great technical care. But the movie is so much more than that. It is an experience. Mr. Jackson is an engaging story teller who has done phenomenal work in bringing this Great War footage to us differently than has ever been attempted. For him, it was a labor of love, dedicated especially to his Grandfather. The story followed British soldiers from home to training, then the trenches and combat, and back home. The movie was a composite experience, using movie footage from the Imperial War Museum and audio from many BBC and IWM interviews of British soldiers. It captured the Western Front experience, including the sights and sounds of being in the trenches and a trench raid. The actual scenes of combat were depicted through the use of artwork from contemporary publication “The War Illustrated”. Although the movie was about British soldiers, the heart of the story was applicable to soldiers from all countries. The movie was unflinching in showing the horror and devastation of the war. It equally showed the human side with the soldier’s everyday life and their interactions with German prisoners of war. There were horses and tanks, showing old and new ways of waging war meeting on the battlefield. After the movie ended, most of the audience remained to spend some promised time with Mr. Jackson. His story telling ability also shined in his short feature after the movie’s credits where he shared how the story began and how it was made. The technology and techniques involved were fascinating. The people who worked on the project were professionals, and the parts that went into creating this experience were interesting. Mr. Jackson’s dedication to the project and its content were unquestionable. He showed us his assortment of authentic uniforms. The archival research was terrific, highlighted by his finding the orders that were being read in a film clip. He even went to great lengths to get authentic sounds to accompany the footage. In this day of digital sounds, it was great to see a Foley artist at work. He also shared how many other stories were in the Imperial War Museum Archives, from different missions in the British Expeditionary Force to women working on the home front. My fondest hope is that more WWI footage is restored using his approach and brought to the public. That would be a great way to keep this from being a “forgotten” war. For me, his thoughts at the end were as compelling as his project itself. As a non-historian, he had made a movie for non-historians to motivate them to find out about their WWI ancestors. He encouraged people to find out these stories, because those stories are important to us. Through my books, lectures and participating in WWI Centennial events, this is what I have also tried to do in my own way. Congratulations on taking the first step of wanting to learn more! Ryan Hegg of the WWI Centennial Commission for New York City asked me if I believed that the WWI Generation was really the Greatest Generation. What a thought provoking question! Ryan makes a great case. 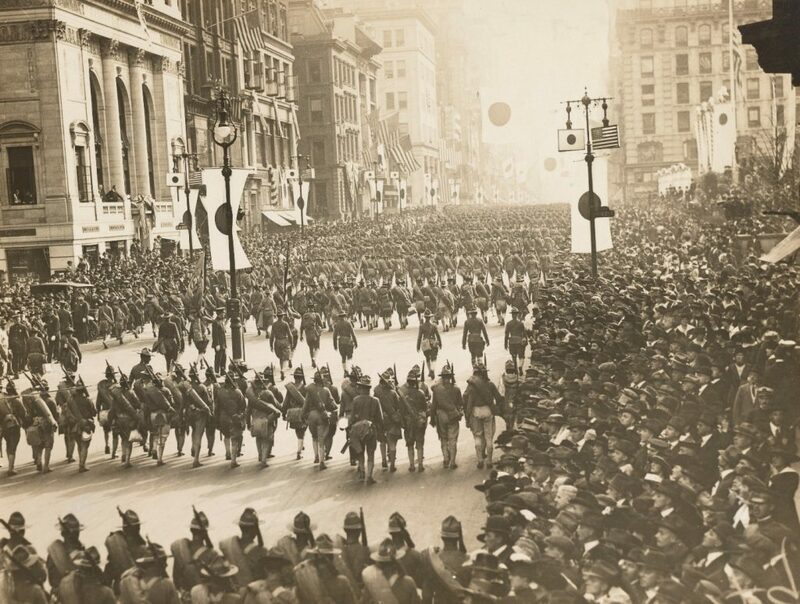 WWI was a defining point in our Country’s history as a participant on the world stage. Theirs was a generation who decided to go overseas to fight the Great War for Civilization. They experienced the Great Depression. Locate a WWI Memorial in your city or town. There may be a statue in a park or a plaque in a public building. You can contact your city or town office to ask if such a memorial exists. When you locate the memorial, you can take pictures of it and copy the names that you find. If you want to learn more about those individuals try some of the other steps. Ask at a local cemetery about WWI veterans’ graves. The tombstones for service members who died during the war or later should show the branch of the military, the war, and their military organization. 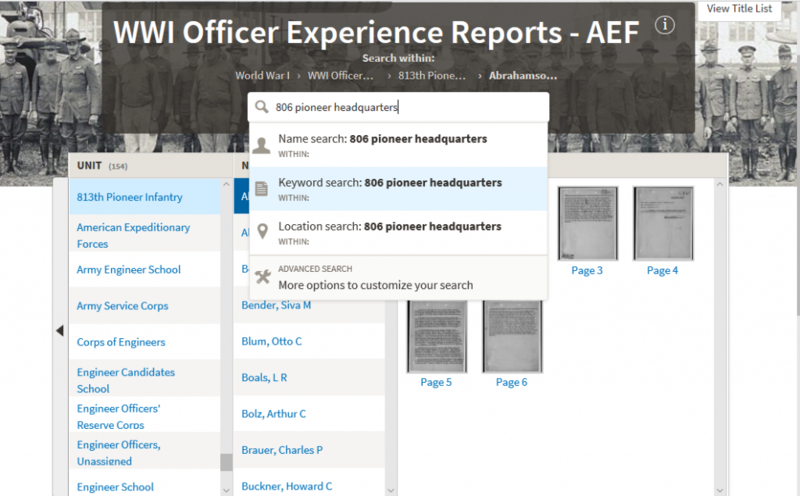 The cemetery office should be able to help you locate the graves of WWI veterans. Go to your local library and ask to speak to the research librarian. The library may hold special books telling about local men and women who served in WWI. There many also be files of materials donated by local researchers, which may be called vertical files. They may have fold local newspapers or files of newspaper clippings. Contact the local chapter of the Veterans of Foreign Wars (VFW). Each Post is unique and has different polices pertaining to its community service efforts. You can visit VFW’s Find-A-Post feature here to locate a VFW Post and its contact information. Ask to speak with the Commander or Quartermaster. If there is a local historical society, genealogical society, or historical museum in your area, call or send an email. I have found WWI collections in unlikely locations, such as the Laws Railroad Museum and the Holland Land Office Museum. Research local newspapers of the time. You can check the Library of Congress Chronicling America website to find out what newspapers existed at the time, and see if any of them have been digitized. Many community newspapers printed articles about the men and women who served. 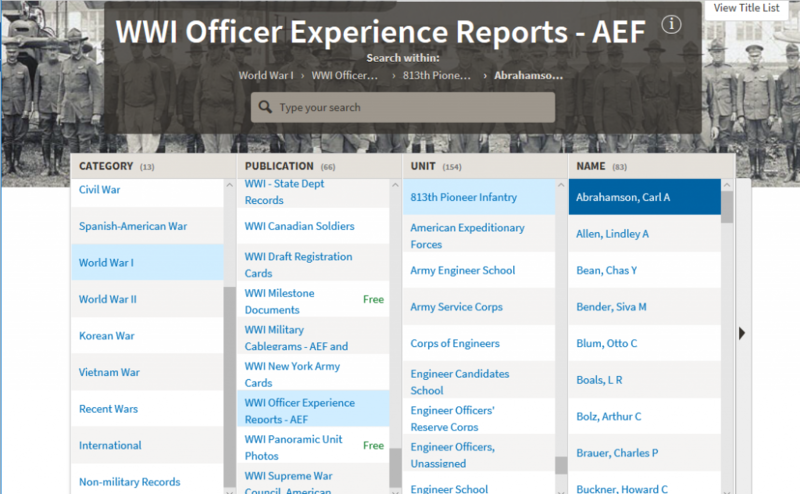 Search for WWI and your community name. Head back to your library and find out what databases are available. 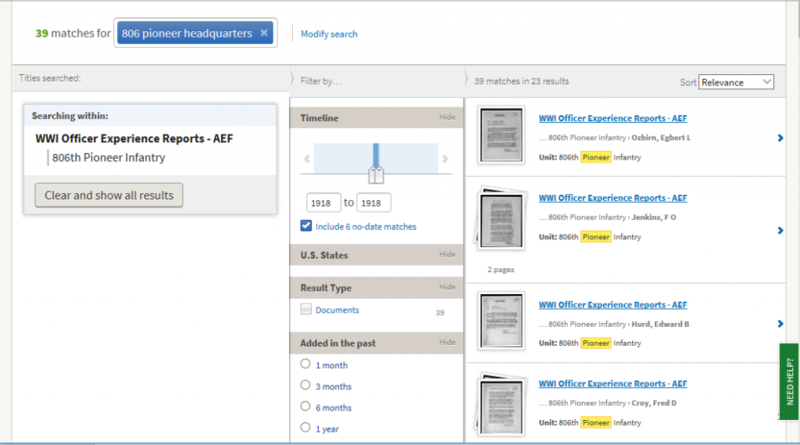 Your local library may have access to Ancestry.com, Fold3.com and ProQuest and other Historical Newspapers. 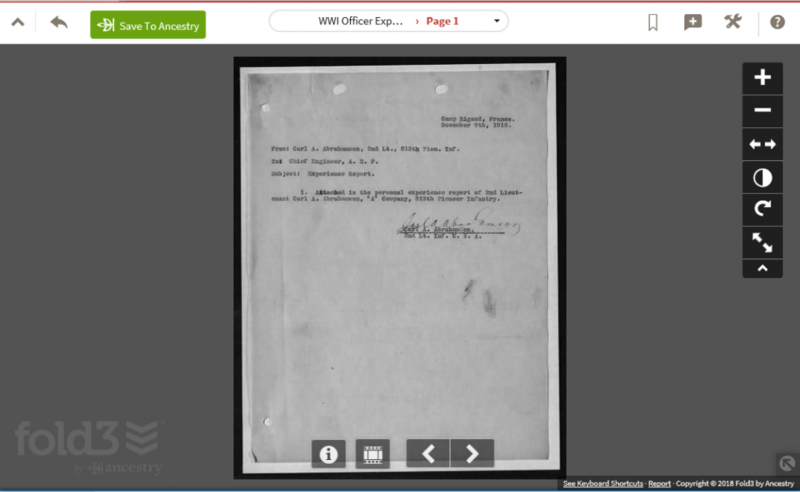 Librarians should be able to help you search for more about a specific WWI Veteran using his or her name. Beyond these steps, much of the research involves looking for material about a military organization in which the veteran served. 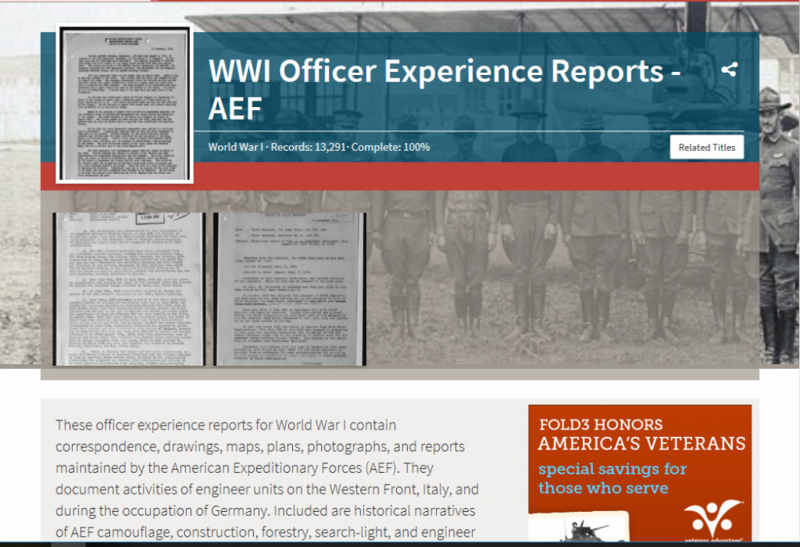 There are several posts on this blog about learning more about WWI Veterans. In addition to the displays of Holland Land Office material, discussed in the Family History Outing: The Holland Land Office Museum blog post, there was another exhibit of interest to me. 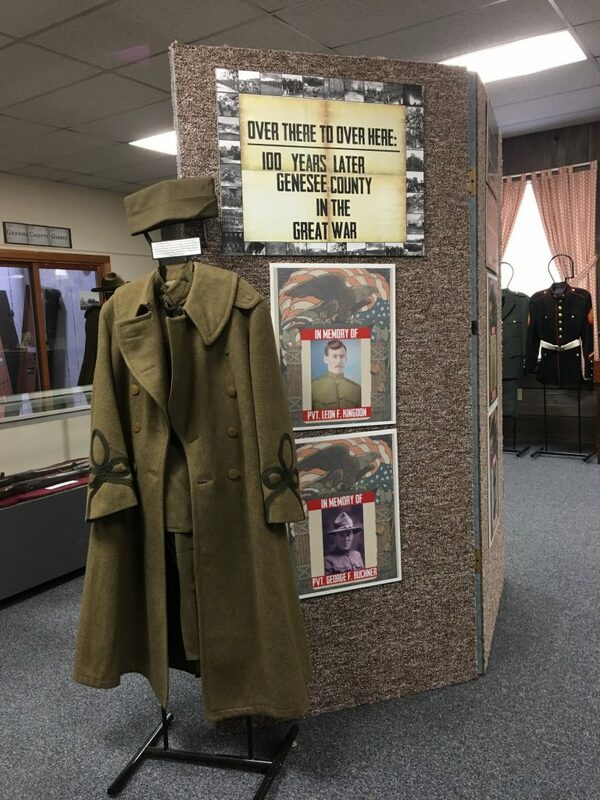 The HLOM has an exhibit “Over There to Over Here: 100 Years Later, Genesee County in the Great War,” which is featured on their website. The Museum is home to artifacts from the Great War. 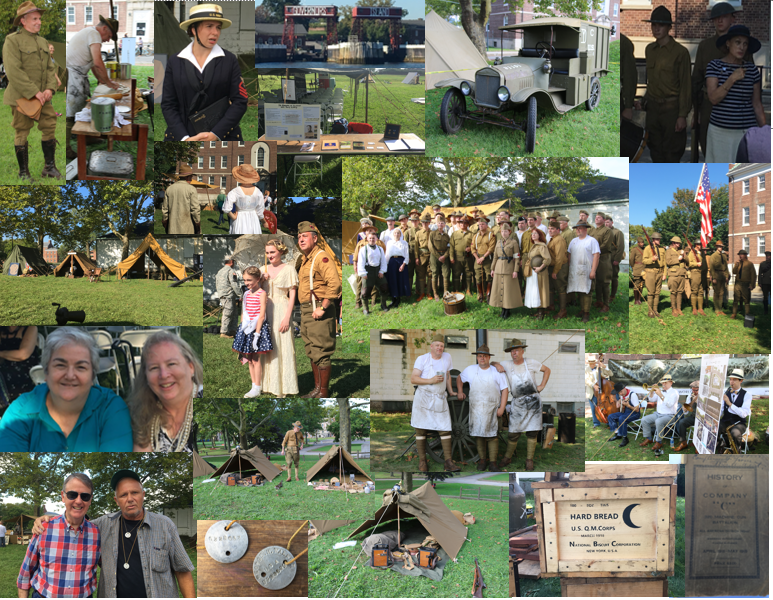 Soldiers’ equipment, uniforms and other WWI memorabilia are on display. There are artistically decorated helmets, and sheet music. Every item is clearly labeled, and the exhibit has been put together with great care and thought. In the displays, WWI history moves beyond the descriptions and illustrations in books to real objects. For me, seeing a soldier’s pick, that had been over than back over here, brought to mind equipment used by the Pioneer Infantry Regiment. The exhibit includes a book where the names of Genessee County residents who served in WWI have been collected. Some were residents before the war, while other veterans settled in Genessee County after the Great War. It is always important to check the holdings of all the museums and archives in your ancestor’s local area. For example, Executive Director Duffy told a story about one visitor who was surprised to find several items, including a dogtag and discharge papers, for a relative he did not even know was a soldier in WWI. 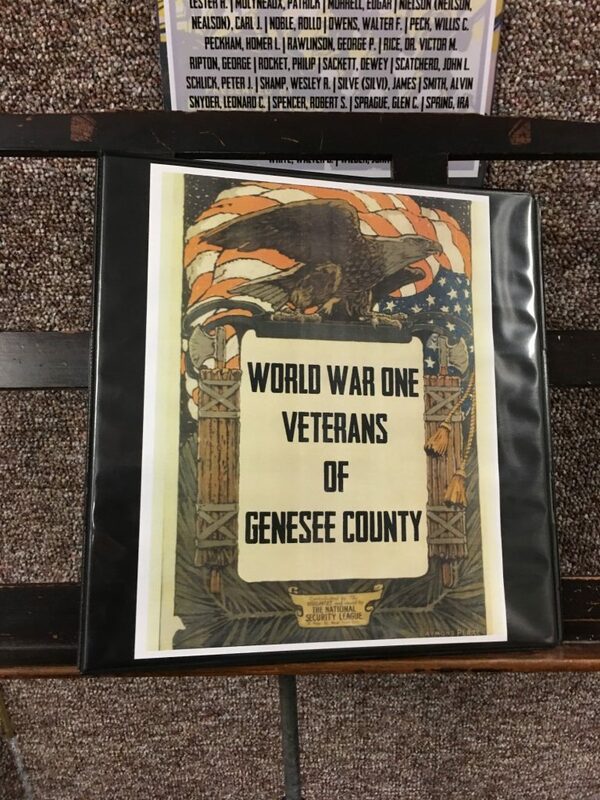 The Museum also display items from the military service of Genesee County residents in other wars. Even though we did not have Genesse County ancestors, we enjoyed this part of our visit to the Holland Land Office Museum. So, if you find yourself near Batavia, NY, think about stopping in. To learn more, visit the Holland Land Office Museum website.